The newly redesigned 2020 combines an advanced microprocessor with a patent-pending optical chamber resulting in higher accuracy and a wider range. The multi-detector optical configuration assures long term stability and minimizes stray light and color interferences. All readings are determined by the process of signal averaging over a 5 second period. This minimizes fluctuations in readings attributed to large particles and results in rapid, highly repeatable measurements. 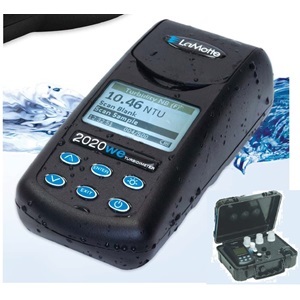 Ideally suited for both low-level drinking water applications as well as monitoring high turbidity in the field. Patent pending optical design features focusing optics for low level precision and accuracy. Six user selected languages – English, Spanish, French, Japanese, Italian, and Portuguese. MSP430 Microcontroller used is the most advanced controller on the market for hand held applications. Tube positioning ring limits vial variability. Easy menu driven operation and large LCD display. 4000 point data log, stored results can be viewed directly on instrument or downloaded to a computer via RS232 cable. Kits are supplied with 0, 1, and 10 NTU standard, sample bottle, four sample tubes, and an extra battery. AC power adapter is optional.